Ask anyone around town if they have ever had food made by Susan Plunkett and the answer is probably a very enthusiastic Yes! From her two Rochester restaurants to her catering business in the Regional Market, Plunkett’s has been cooking up good eats for doctors and nurses, professors and students, brides and grooms, families and friends. 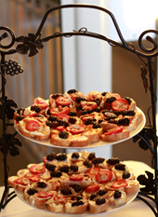 Jazzberrys and Plunkett's Catering are also popular choices for visiting writers, actors, newscasters, musicians and even FoodTV star Giada DeLaurentiis. One of the things that really sets Plunkett’s apart is a passion for the freshest, highest quality ingredients, the most diverse ethnic menus and the most professional presentation. We are also quite responsive to special dietary requests as well, with vegan, vegetarian, gluten-free and lactose-free options. Everything from soup to desserts is made on the premises with the freshest ingredients. And, Plunkett’s can take care of all your arrangements from theme decorations, linens and china, to music booking and rentals so you can really enjoy yourself at your special event. In short, if you dream it, Plunkett’s can create it. “We have used Susan Plunkett’s Fabulous Foods for many multicultural events, and the meals are always wonderfully diverse and thoughtfully prepared. Susan makes many accommodations for us, including gluten-free, vegetarian, vegan, Halal, and Kosher options. She has also created many delicious themed meals that our international students rave about long after they’ve been consumed!" Contact Us Today For Events Your Guests will Rave About for Years!